Home Hot Deals Latest News Slider World News Precision Air to launch direct flights between Dar es Salaam and Kigoma, Bukoba. Precision Air to launch direct flights between Dar es Salaam and Kigoma, Bukoba. Precision Air (PW) has announced to introduce two direct domestic flights and suspend one international route starting Wednesday this week. The airline will launch direct flights between Dar es Salaam on one hand and Kigoma and Bukoba on the other and suspend its flights to Hahaya in Comoros the same day. The company said at the weekend that the direct flights were in response to customers’ outcry. 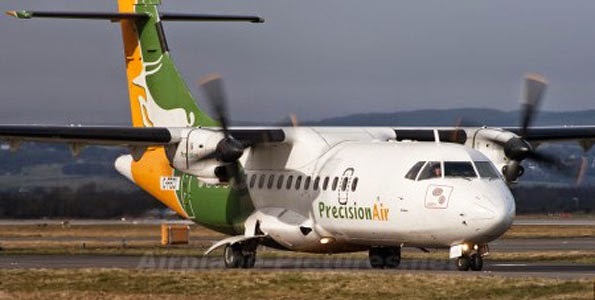 Precision Air, which is listed on the Dar es Salaam Stock Exchange, has been serving the two local destinations via Mwanza. “We have done this in response to our customers’ feedback and constant requests for direct flights,” said Mr Elvis Ndomo, acting commercial director. Kigoma will receive three flights a week on Mondays, Tuesdays and Fridays while Bukoba will be served four times a week on Tuesdays, Thursdays, Saturdays and Sundays. Meanwhile, the airline is temporarily suspending its Hahaya (Comoros) route effective Wednesday as it seeks to optimize its resources and deploy them on commercially viable routes. Mr Ndomo said that operations on the route will resume as soon as conditions allow, adding that Precision Air remains committed to her goal of developing a regional route network focused on the East and Central Africa, including the Indian Ocean islands.